In today’s gym equipment market, there is a certain race which has started and is of producing the best quality barbell in fitness market. Though, after using barbells of many different companies, I have come to a point that all these companies are producing same quality barbells, having only a slight or minor of change in quality and specifications. 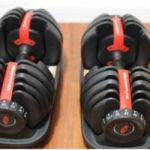 But, that slight change produces a huge effect on buyers’ pocket, hence leaving you with a sub-par eventually.American Barbellgives a very solid feel in all of its barbells that are available in the market. The quality and durability of each of them is impressive and challenges many good companies around the world with respect to its specifications. The dropping of the bar doesn’t produce a rattle, which is mostly present in many multipurpose and traditional barbells. 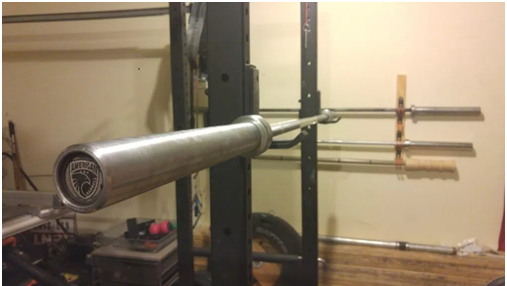 The sleeves of the barbell, fits on the bar perfectly hence giving an actual tight fit on end caps. 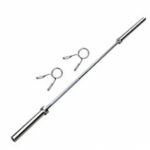 The California Bar is the first dual-marked Olympic bar made by American Barbell. Before that, American barbell didn’t sold any multi-purpose bar, except they were fond of selling power bars, Olympic bars and training bars. 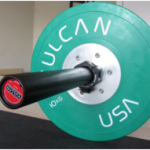 Thus, when they noticed that nowadays most of the CrossFit and commercial gym are turning their interest on multi-purpose bars, it was just a matter of time when American Barbell amazed the barbell market by its new California bar having dual-marking. Considering its price tag, The California bar by American Barbell is one of the best barbells in the market of gym equipment. The California Bar is American Barbell’s first constructed dual marked CrossFit bar, and it was made to challenge Rogue Ohio Bar 2.0. However, in the last couple of years, it had some nice upgrades whichhas put The California’s specifications and price, much greater in line with high end multi-purpose bars like classic Rogue Bar and SS Ohio Bar. 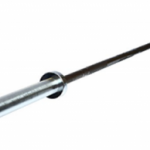 The California Bar matches the industry standard of 190,000 PSI alloy steel shaft. It comes with dual IPF/IWF markings, having no center knurl, which makes the sleeves spin freely and reliably on high-load compound bushings rather than traditional bronze bushings. What makes the California bar completely genuine from any other multi-purpose bar on the market is its finish. The bar is coated with a black graphite Cerakote finish, having the same oxidation prevent finish used for firearms. This finish is neat and repetitive looking, completely rust-proof, and standard tacky. 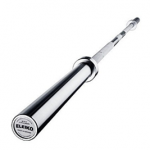 Some other features that make the California Bar different from the Rogue bars, is the use of actual 28 mm shaft rather than the usual 28.5 mm shaft, and the use of manufacturers chrome for the sleeves rather than cheaper black zinc. The American barbells are mostly bushing bars, in them one common nature is of compound (acetal) bushings except of bronze bushings. Hence, bronze bushing doesn’t carry any drawbacks but compound bushing does carry some aspects that make them look one step further than bronze. It is recommended for beginners to use composite bushings due to their rigidness and greater impact resistance than bronze. They are very unlikely to crack and peel while handling more weight. It is due to the fact that composite brushing consists of high tensile strength which makes the rotation constant under heavier loads. Adding more weight will drag your barbell sleeve, hence this issue of dragging can be solved in case of composite bushing bars. One another benefit of composite bushings is that, it produces less noise when bar is dropped from a certain height. Having plastic separation between metal shaft and sleeves rather than a metal component, reduces the banging and clanging of a dropped bar. Though, noise is a huge issue for the ones who are working out in a compact space. 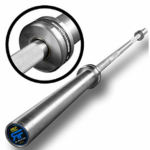 The California barbell consists of dual marking, thus having both IPF and IWF hash marks. There is no center knurling and any outer knurling which may extend to the sleeves. When talking about hostility of knurl, its knurling is a bit of moderate. Though they are very consistent, but the knurling is quite a bit light in my point of view. But even with that, the gripping is very comfortable, which lets you hold the bar very tightly, though applying a chalk can also get your job done. 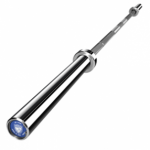 The California Barbell consists of black zinc coating on the shaft. It is preferable to use black zinc because it protects the metal from oxidation rather than oxide and also is affordable. Though, many people don’t choose black zinc because it chips off easily but using chrome is also not an easy option to go for because it is expensive. The weight of the bar is 20kg for men and 15kg for women. The diameter of shaft is 28mm for men and 25mm for women. Sleeves are assembled with high load composite bushings. The bar has a dual knurl pattern with IWF and IPK, having no center knurl. The knurling depth is moderate. Consists of black zinc finish with heavy duty chrome sleeves. The bar is manufactured in USA. In my opinion, this was the best barbell I used for my CrossFit because, it gave me a smooth whip, having comfortable and secure handles. I had no issue performing deadlift, snatches, bench press, cleans and curls with this bar because the weight fits on the collar perfectly, thus having no issue of bending or breaking of barbell no matter how much heavier the weight is. Having a moderate price, it provides you with tons of features and benefits like bronze bushing, dual knurl mark, black zinc coating and muchmore. These same exact features can be also found in a barbell which is exactly twice theprice ofAmerican Barbell. Also, having an actual edge of 28mm diameter, makes the barbell function in a better way. The best thing ofAmerican barbellis that it doesn’t produce excessive noise because of plastic padding between shaft till the collar, as having excessive noise can disturb my neighbors and kids while sleeping. Overall, I would like to recommend American Barbell’s California Bar to everyone due to its extensive features and affordable price. The bar consists of composite bushings which reduce noise and doesn’t crack or split open after dropped from a certain height. 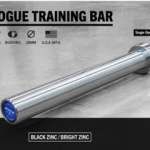 The bar has a black zinc finishing on it which protects the barbell from oxidation in humid regions. The knurling done on the bar is moderated to a level that it can handle heavier weight while giving you a secure and comfortable grip. The bar is very expensive as compared to many barbells available in the market. Black zinc may chip off after some time. With moderate knurling, you may needto apply powder for heavier weight lifting.